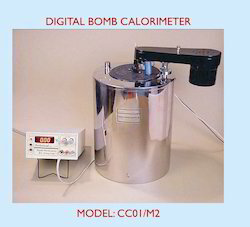 Our range of digital Bomb Calorimeter is respected worldwide for its simple design and inexpensive method of reading calorific value of solids, or liquids like fuel. We avail custom Bomb Calorimeter as per the drawings & specifications of our clients. The entire range we offer is highly reliable and stable for being produced as per the latest market trends & using premium raw-materials. 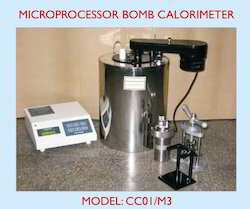 We are engaged in offering a diverse range of Micro Processor Bomb Calorimeter which is commonly used for determination of calorific value of liquids & solids. Our range is respected by the clients for high quality standards and is manufactured in accordance with the latest market trends. • Automatic feeding of Calorific values of ignition wire & cotton thread: Just feed the length of Ignition wire and cotton thread, software will automatically convert it into respective calorific values. • Automatic Firing in the Bomb. • Automatic delivery of result datas in report format. • Automatic graph plotting between time vs. temperature. This system is also available with out PC. In that case PC has to be arranged by user at their end. 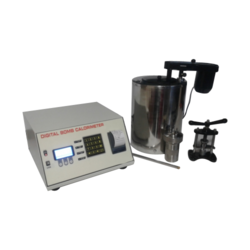 Toshniwal Bomb Calorimeter with Digital Differential Temperature (DDT) / Firing Unit (FU) Model CC01/M2 provides an accurate, simple & inexpensive method for determination of Heat of Combustion, Calorific Values & Sulphur contents of solid & liquid fuels. SS 316 Mo is used to fabricate Combustion Bomb and its other vital parts to ensure the maximum safety of the user. Outer jacket made up of S.S. is filled with highly insulated material so that heat transfer from / to the system is practically nil & no cooling corrections are required to get the final result. We are dedicatedly engaged in offering Digital Bomb Calorimeter With Software & Pc to our prestigious customers. This calorimeter is used to measure calorie in food material that includes liquid or solids. It is available with its software that can be installed in the computer and can be operated precisely. Various other accessories available with it are digital display for temperature identification, LED identification for filament continuity and bomb calorimeter combustion. Looking for Bomb Calorimetry ?